Northeastern Naturalist Vol. 24, No. 1 M.T. Begley and R.A. Krebs 2017 1 2017 NORTHEASTERN NATURALIST 24(1):1–14 Application of OEPA-Produced Biotic Indices and Physical Stream Measurements to Assess Freshwater Mussel (Unionidae) Habitat in the Upper Mahoning River, Ohio Matthew T. Begley1 and Robert A. Krebs1,* Abstract - Freshwater mussels continue to experience declines in population numbers in response to changing environments. Identifying aspects of the environment associated with the presence and abundance of mussels in small streams is challenging where past records are minimal. Thus, we sought to produce models of habitat favoring mussel species richness and abundance in the upper Mahoning River using data collected in 2 ways: (1) surveying sites deemed as suitable habitat via observation and (2) surveying existing Ohio Environmental Protection Agency (OEPA) sites used to evaluate water quality and aquatic life through biotic indices. Detailed physical measurements were added at each survey site. Surveys identified 963 freshwater mussels of 11 species. The more-forested Eagle Creek contained an abundant mussel assemblage compared to the rest of the Upper Mahoning River, yet this stream was still dominated by just 1 common species, Lampsilis siliquoidea (Fatmucket). Drainage area alone correlated with mussel richness and abundance, but a complex model of multiple characteristics provided equivalent predictive power to assess how variation in environmental components may enhance the likelihood of mussel presence. The OEPA composite qualitative habitat evaluation index, which encompasses substrate, instream cover, channel morphology, riparian zone, pool quality, and map gradient, also was indicative of greater mussel diversity. Introduction Many streams and their associated animal communities have deteriorated in response to human-driven changes to the surrounding landscape. Impervious surfaces and agricultural fields left bare of vegetation increase the flashiness and water temperature of runoff within both urban and agricultural lands (Kaushal et al. 2010, Weil and Kremen 2007), as well as sediment loads (Allan et al. 1997, Jones et al. 2001), metals (Lenat and Crawford 1994) and nutrients (Duan et al. 2012, Gordon et al. 2008, Strayer et al. 2003) in neighboring streams. Such changes to surface cover can reduce diversity in assemblages of macroinvertebrates (Liess et al. 2012, Roy et al. 2003), fish (Vondracek et al. 2005, Wang et al. 2003), and freshwater mussels (Atkinson et al. 2014, Gangloff et al. 2009, Gillies et al. 2003), and persistent species in areas that have experienced such landcover changes are often those more tolerant of poor water quality (Helms et al. 2005, Peacock et al. 2005, Poole and Downing 2004). 1Department of Biological, Geological, and Environmental Sciences, Cleveland State University, 2121 Euclid Avenue SI 214, Cleveland, OH 44115. *Corresponding author - r.krebs@csuohio.edu. Manuscript Editor: David Yozzo Northeastern Naturalist 2 M.T. Begley and R.A. Krebs 2017 Vol. 24, No. 1 A critical challenge to assessing relationships between stream conditions and a specific biological assemblage is the collection of key habitat data. For imperiled mussel species in the family Unionidae, as reviewed by Strayer et al. (2004) and Haag and Williams (2014), habitat characteristics at multiple spatial scales influence mussel assemblage composition (Haag 2012, Watters 1992). Impoundments change habitat (Hardison and Layzer 2001, Vaughn and Taylor 1999), and dams restrict dispersal (Watters 1996), but an understanding of how variation in stream morphology and water quality affect diversity in free-flowing streams has remained elusive, especially within small streams (Layzer and Madison 1995, Lyons et al. 2007, Strayer and Ralley 1993). Value and efficiency may be added to mussel surveys by aligning them with stream assessment sites used by state agencies like the Ohio Environmental Protection Agency (OEPA), which monitor the interaction of chemical, physical, and biological processes to assess health and well-being of surface waters and their biota (Karr 1991, OEPA 2011). The OEPA reports drainage area, a qualitative habitat evaluation index (QHEI; OEPA 2006), a fish community metric (index of biotic integrity or IBI), and land use of subwatersheds. Biological criteria are one of the principal assessment tools by which the status of water bodies is determined in Ohio (Yoder and Rankin 1996), but mussels are not part of any OEPA analyses, which makes contrasts between mussel diversity and these metrics statistically independent. To assess components of the habitat associated with greater richness and abundance, we searched sites in the Upper Mahoning River, a headwater system of the Ohio River, for mussels in areas never previously examined. We surveyed Eagle Creek in 2013, targeting easily accessible sites with apparent suitable habitat (determined via observation), and then sampled across the Upper Mahoning River watershed in 2014 at sites where OEPA biotic indices were collected in 2006 (OEPA 2011). Methods Our surveys encompassed the Upper Mahoning River (UMR) watershed in northeastern Ohio. This 1500-km2 headwater catchment of the Ohio River lies adjacent to Ohio’s northern divide, which separates the Lake Erie and Ohio River watersheds. The UMR composes 4 sub-watersheds (Fig. 1) that in total are 37% forested, but as land use shifts to more agriculture from north to south, cropland (23%) and pastureland (17%) combine to comprise a larger proportion than forest overall, and just 12% of land is considered developed (OEPA 2011). Several large reservoirs occur on the Mahoning River, another on the West Branch Mahoning River, and small dams are also present, including in Eagle Creek. We surveyed 8 sites in Eagle Creek in 2013 and 20 sites throughout the UMR in 2014 at locations with OEPA data (Fig. 1; http://wwwapp.epa.ohio.gov/dsw/gis/ bio/index.php). Only site 4 was sampled both years. 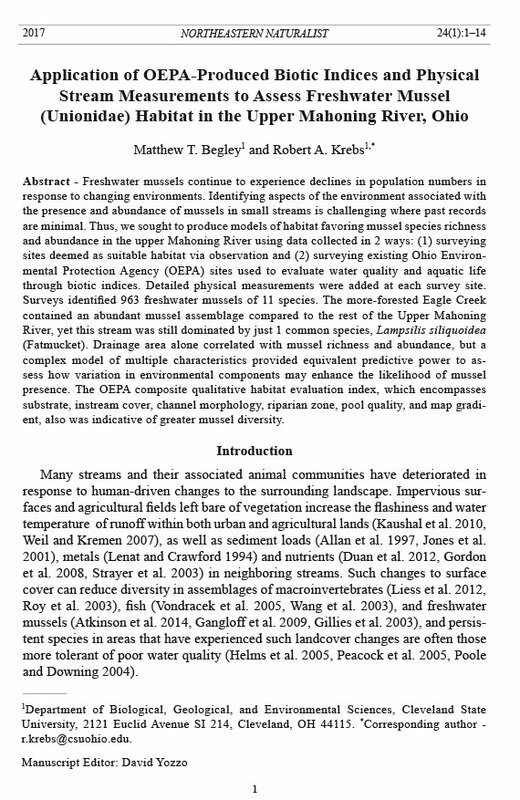 Aquatic life-use attainment categories were analyzed as discrete values (non attainment , partial attainment , and full attainment ) based on combined scores from a mix of habitat, fish, and macroinvertebrate community indices relative to typical community and physical conditions for similar regions (Yoder and Rankin 1995, 1996). Northeastern Naturalist Vol. 24, No. 1 M.T. Begley and R.A. Krebs 2017 3 Figure 1. Study sites within the Upper Mahoning River. The top shows sites within Eagle Creek surveyed for mussels in 2013 and encircled numbers indicate the sites surveyed in 2014 that correspond with the Ohio EPA aquatic life-attainment measurements indicated for each site. The 4 subwatersheds separated for land use were Eagle Creek, West Branch Mahoning River, Deer Creek, and Mahoning River headwaters. Large impoundments include the Lake Milton Dam (built 1913), Berlin Lake Dam (built in 1943), the Michael J. Kirwan Dam (built in 1966), and the smaller Deer Creek Dam (built in 1955) just above Berlin Lake. Northeastern Naturalist 4 M.T. Begley and R.A. Krebs 2017 Vol. 24, No. 1 We conducted timed visual and tactile searches for mussels in 2013 by wading at each site for 4 person hours in a haphazard pattern within the stream, intensifying searches to immediate areas where mussels were found. In 2014, two-person-hour surveys were restricted to a 100-m stretch of the stream bed (upstream of road crossings, if present), which covered all habitat types within the constrained area. Turbidity and depth were low enough that visual searches were possible at most sites. Mussel rakes and tactile methods were used in deeper areas. All live mussels found were removed from the sediment, identified, measured for length, and returned to the streambed. We deposited voucher specimens at Cleveland State University. We recorded physical characteristics at each site in 2014 (Table 1) as an average value from 5 transects made 20 m apart, starting at the most downstream portion of the mussel survey. We characterized stream size by measuring channel width, average depth, bankfull width, bankfull depth, and discharge following protocols in Gordon et al. (2004), with specific details in Begley (2015). Discharge was calculated by measuring average flow velocity with a digital flow meter (Hach FH950) at 1-m intervals across each transect. We assessed median grain size of the substrate using 100 randomly selected samples, measuring all pebbles (>2 mm), while recording sand, silt, and clay as 0.5 mm, 0.03 mm, and 0.004 mm, respectively (Wolman 1954). We estimated shear stress at baseflow and bankfull levels by multiplying the density of water (1000 kg/m3) by the gravitational constant (9.8 m/s2), stream slope, and the average depth at baseflow and bankfull conditions, respectively. Stream Table 1. Variables recorded to characterize 20 stream sites in the Upper Mahoning River. Summary statistics (minimum, maximum, mean) are for variables prior to transformation. All sites within a sub-watershed received the same land-cover values. Transform Abbreviation Explanation (units) (if used) Mean Range n Live mussels found per site 13.9 0–149 R Species richness 1.65 0–6 Drainage Drainage area at survey site (km 2) log10 39.6 7.7–188.4 Pebble Median grain size (mm) x1/2 13.6 0.03–46.5 BaseflowStress Shear stress estimated at baseflow (Pa) x1/2 4.97 1.6–11.7 BankfullStress Shear stress estimated at bankfull (Pa) 23.7 8.9–42.0 Forest Proportion forested land cover 0.39 0.24–0.46 Agriculture Proportion agriculture land cover 0.38 0.30–0.51 Developed Proportion developed land cover 0.11 0.07–0.20 pH pH 8.03 7.47–8.50 Conductivity Specific conductivity (mS/cm) log10+1 780 450–1590 Discharge Discharge measured at each site (m3/s) 0.11 0.00–0.60 BankfullWidth Bankfull channel width (m) log10 10.3 5.6–25.5 Width Baseflow channel width (m) log10 5.9 2.4–14.6 BankfullDepth Bankfull water depth (m) 1.18 0.73–1.60 Depth Baseflow water depth (m) x1/2 0.26 0.10–0.70 Slope Slope of stream reach (m/km) 2.2 0.6–5.3 QHEI Qualitative habitat evaluation index 60.1 42.5–81.5 IBI Index of biotic integrity 36.0 20.0–51.0 Attainment Aquatic life use-attainment status 1.2 0–2 Northeastern Naturalist Vol. 24, No. 1 M.T. Begley and R.A. Krebs 2017 5 slope was measured using contour lines within USGS 1:24,000 topographical maps and expressed as a ratio of elevation change over distance. We examined physical measurements for normality using the Shapiro-Wilk test and normalized variables that did not pass the test using log10(x), log10(x+1), or x1/2 transformations (Table 1). Abundance and species richness were not transformed due to the large number of zeros in the data. We entered land cover in models as the proportion of forested, agricultural (cropland + pastureland), and developed land present in each of the 4 main sub-watersheds as reported by the OEPA (2011). Visually these sub-watershed values appeared to be consistent and indicative of conditions at each site. To model physical stream characteristics, we assessed differences in environmental variables between sites with and without live mussels using MANOVA and Pearson correlations run in SPSS (Ver. 19, IBM Corp., Armonk, NY) followed by principle components analysis (PCA) in R (Ver. 3.0.2, R Core Team, Vienna, Austria). Contrasts were made among 20 sites where OEPA data were available, both with and without QHEI and IBI, which were unavailable for 1 site. We tested applicability of PCA components to richness and abundance using backward regression. We separately applied Poisson and negative binomial regressions to data on all sites, as these account for the non-normal distribution and excess of zero’s in the response variables (O’Hara and Kotze 2010). Species richness was modeled by Poisson regression because the mean and variance were roughly equal (Ramsey and Schafer 2002), but we used negative binomial regression to model abundance due to over-dispersed variation (variance >> mean) (Stamey and Beavers 2009). Our examination of how site-specific environmental variation may impact specific species differently was limited to the 8 species found in the 20 sites surveyed in 2014. Associations were modeled in canonical correspondence analysis (CCA), a constrained ordination procedure that examines how much of the variation in one set of variables explains the variation in another set of variables. The environmental variables retained were those we found to have low multi-collinearity by using the “cca” function in the R package “vegan” (Oksanen et al. 2015), which treats the environmental variables as predictors of the ordination of species. Results Diversity and abundance was greater in Eagle Creek (which contained all 12 species [11 live] found, 910 live individuals) than in the remaining Upper Mahoning watershed (5 species and 53 live individuals) (Table 2). The most widespread species across both years were Lampsilis siliquoidea (Fatmucket) and Pyganodon grandis (Giant Floater), while Elliptio dilatata (Spike) occurred at just 2 sites, but was numerous at both (site 6, n = 117; site 10, n = 27; Fig. 1). Three species, Lasmigona complanata (White Heelsplitter), Lasmigona compressa (Creek Heelsplitter), and Strophitus undulatus (Creeper), appeared widely dispersed but never locally abundant. The remaining 6 species totaled just 14 live individuals, and Amblema plicata (Threeridge) was represented by only 2 old shells (Table 2). A rarefaction Northeastern Naturalist 6 M.T. Begley and R.A. Krebs 2017 Vol. 24, No. 1 analysis suggested nearly complete identification of species presence (11.9 + 0.3 species predicted, 12 observed, including shell data). Mussel abundance and species richness each correlated significantly and positively with several measures of stream size, particularly drainage area (r = 0.69, P = 0.001 and r = 0.85, P < 0.001, respectively). Only 1 live mussel was found at a site with a drainage area <20 km2. Fish IBI score was also correlated with drainage area (r = 0.61, P < 0.01), but this index did not differ significantly among sites with and without mussels (37.9 vs. 34.2, respectively, P > 0.10). Physical measurements of stream size also correlated with mussel numbers and species richness, which included stream discharge (r = 0.66, P < 0.01 and r = 0.66, P < 0.01, respectively), bankfull width (r = 0.53, P < 0.05 and r = 0.59, P < 0.01, respectively), and baseflow width (r = 0.49, P < 0.05 and r = 0.67, P < 0.01, respectively), as well as QHEI (r = 0.54, P < 0.05 and r = 0.49, P < 0.05. respectively). The QHEI score from the OEPA averaged 64.6 where mussels were found and 56.3 for sites lacking mussels. Mussel species richness associated with higher pH (r = 0.45, P = 0.047), although no sites were acidic (Table 1). No live mussels were found where specific conductivity exceeded 900mS/cm, which was a water measurement inversely related to the proportion of forest (r = -0.70, P = 0.001). Only 4 live mussels were found at sites in the non-attainment category for aquatic life use: 1 at site 15 and 3 at site 17 (Fig. 1). Four sites that met full attainment lacked mussels, of which 3 sites had small drainage areas and/or high shear stress (sites 2, 11, and 13) and the other (site 18) lay in the Mahoning headwaters with the highest agricultural and urban land use. Table 2. Abundance and presence of mussels in the Upper Mahoning River watershed: 8 sites surveyed in Eagle Creek (2013) targeting sites based on visible habitat, and 20 sites across the watershed surveyed (2014) aligned with OEPA water quality sites. Only 2 of 8 Eagle Creek sites were sampled both years. West Branch Eagle Creek and Upper 2013 2014 Mahoning Species (8 sites) (8 sites) River (12 sites) Ortmanniana ligamentina (Lamarck) (Mucket) 01 1 0 Amblema plicata (Say) (Threeridge) 01 0 0 Elliptio dilatata (Rafinesque) (Spike) 3 117 27 Lampsilis ovata (Say) (Pocketbook) 0A 0 2B Lampsilis siliquoidea (Barnes) (Fatmucket) 493 56 19 Lasmigona complanata (Barnes) (White Heelsplitter) 48 8 0 Lasmigona compressa (Lea) (Creek Heelsplitter) 9 12 2 Lasmigona costata (Rafinesque) (Flutedshell) 0 1 0 Pyganodon grandis (Say) (Giant Floater) 80 17 3 Strophitus undulatus (Say) (Creeper) 39 14 0 Toxolasma parvum (Barnes) (Lilliput) 5 0 0 Utterbackia imbecillis (Say) (Paper Pondshell) 7 0 0 Totals 684 226 53 AOne or 2 old shells discovered. BThese 2 live individuals were found outside of formal surveys on the main branch of the Mahoning River. Northeastern Naturalist Vol. 24, No. 1 M.T. Begley and R.A. Krebs 2017 7 A PCA reduced 83% of the environmental variation to 4 component sets of variables that were regressed against mussel abundance and richness (Table 3). No variable had a loading above |0.50|, but 14 of 15 variables remained in at least 1 component. Applying backward stepwise regression to these PCA variables, components 1 and 3, which together composed 8 different variables with loadings of at least |0.3| , explained 57% of the variation in species richness (P < 0.001) and 40% of variation in abundance (P < 0.01). Adding components 2 or 4 did not improve the model based on the Akaike information criterion (AIC). Poisson and negative binomial regression suggested that drainage area alone explained most variation, although a Poisson regression model composed of grain size, baseflow and bankfull shear stress, and depth, plus 2 interaction terms, bankfull shear stress with grain size and baseflow shear stress with average depth (a composition similar to that of PC3) similarly reduced residual deviation and received the same AIC score for richness (57), while the negative binomial regression for abundance increased the AIC a small amount (from 99 to 109). Finally, canonical correspondence analysis (CCA) applied to infer compatibility or tolerance of specific species along environmental gradients accounted for 68% of the species variation with respect to environmental variables (Fig. 2). Within this multivariate construct, the 2 most-dispersed species, Giant Floater and Fatmucket, associated with sites where shear stress, conductivity, and agricultural land cover all were higher relative to values associated with the presence of other species in the study area. Discussion Watershed area remains a consistent predictor of abundance and diversity of mussels (Haag and Warren 1998, Watters 1992), as we observed in the Upper Table 3. Principal components and loadings (>|0.3|) for all environmental variables assessed at 2014 mussel survey sites across the Upper Mahoning watershed. Variable Comp 1 Comp 2 Comp 3 Comp 4 Drainage 0.35 Pebble 0.50 BankfullStress -0.37 -0.40 BaseflowStress -0.38 -0.46 Forest -0.41 Agriculture 0.36 Developed 0.32 -0.36 pH Conductivity 0.30 -0.42 Discharge 0.35 BankfullDepth 0.33 BankfullWidth 0.30 -0.41 Width 0.34 -0.39 Depth -0.47 Slope -0.38 Proportion of variance 0.37 0.21 0.14 0.10 Cumulative proportion 0.37 0.58 0.73 0.83 Northeastern Naturalist 8 M.T. Begley and R.A. Krebs 2017 Vol. 24, No. 1 Mahoning River watershed. A watershed the size of Eagle Creek (329 km2) should have 11–12 species based on a model derived from neighboring Lake Erie watersheds (Krebs et al. 2010a), and this level of richness was observed, although records for 4 of the 12 species hint at loss (old shells only) or risk of expiration (a single live individual). In contrast to Eagle Creek, the 1500-km2 Upper Mahoning River watershed was depauperate, as 24 total species are predicted for a watershed of this size, but we found only 5 species there, none additional to those we encountered in Eagle Creek. Swart (1940), summarized later by Dexter et al. (1963) and Hoggarth (1990), reported 4 additional species just in the West Branch Mahoning River— Anodontoides ferussacianus (Lea) (Cylindrical Papershell), Obovaria subrotunda (Rafinesque) (Round Hickorynut), Potamilus alatus (Say) (Pink Heelsplitter), and Quadrula quadrula (Rafinesque) (Mapleleaf)—none of which have been found since, and including those only raises the total species recorded to 16. Mussels were also much more numerous in sand and gravel where the current was described as swift; these sites (4–8 in Swart 1940) were impounded or isolated by the Michael J. Kirwan Dam (Fig. 1). Such a deficiency today is perhaps expected for a river that Amin and Jacobs (2013) characterize as one of the 5 most-contaminated rivers in the US, with the worst sections beginning at the confluence of Eagle Creek and the Mahoning River at Leavittsburg, OH. Even above the confluence, many impoundments built for flood control since the surveys of Swart (1940) create a predominantly lacustrine river that has isolated streams like Hinkley Creek, which once contained mussels (Wittine 1969). Human alterations often explain loss of unionid mussels, but our goal is to identify what environmental features mussels require, which remains a challenge Figure 2. A biplot of canonical axes 1 and 2 illustrating the ordination of the 8 species found live in 2014 and the most-associated environmental variables. Northeastern Naturalist Vol. 24, No. 1 M.T. Begley and R.A. Krebs 2017 9 (Haag 2012). One expected association is that between host fish and mussel presence, which has received only mixed support (Gagnon et al. 2006, Lyons et al. 2007, Rashleigh 2008). The mussel species present in the Upper Mahoning River watershed all utilize diverse hosts (Krebs et al. 2010a, Watters et al. 2009), and fish diversity, as measured by the index of biotic integrity (IBI), did not explain variation in mussel diversity among sites. One reason may be that the species present are host generalists, which tend to be widespread (Strayer 2008), and for them, a complex set of hydraulic factors may be associated with increased mussel numbers (Hardison and Layzer 2001). Site characteristics as described by the OEPA’s habitat assessment and aquatic life designation reports (OEPA 2006, 2010) indicated a greater likelihood of mussel occurrence in sustained versus degraded systems. Higher QHEI scores, which are a composite index of substrate, instream cover, channel morphology, riparian zone, pool quality, and map gradient, associate with a greater likelihood or abundance of mussels. Stream-bed instability, either from baseflow or bankfull shear stresses, can reduce diversity in both mussels (Allen and Vaughn 2010, Daraio et al. 2010, Gangloff and Feminella 2007, Howard and Cuffey 2003, Krebs et al. 2010b) and fish (Jellyman et al. 2013). The designation of full attainment of aquatic life uses appeared necessary, but not always sufficient, for the presence of mussels. Ortmann (1909) highlighted that unionid mussels can be the first taxon lost with stream degradation. Assessing physical habitat at each site also can identify high-impact factors like bankfull shear stress (Gangloff and Feminella 2007) or specific conductivity, which when >900 mS may be a limiting threshold character (McRae et al. 2004). High specific conductivity is linked to stream impairments from agriculture in Oregon (Pan et al. 2004) and urban land in Australia (Hatt et al. 2004), and is associated with fewer macroinvertebrates (Vander Laan et al. 2013) and mussels (Brown et al. 2010, Gangloff et al. 2009). In addition, past anthropogenic activities may leave behind long-term heavy metal contamination of soils (Clark and Benoit 2009, Falfushynska et al. 2015, Rzymski et al. 2014), imposing diverse effects (Brown et al. 2010, Gangloff et al. 2009, Gillies et al. 2003). Even agriculture may reduce stream fauna at neighboring sites for many years after reforestation (Cao et al. 2013, Maloney and Weller 2011, Poole and Downing 2004). Within the Upper Mahoning watershed, Eagle Creek may have the fewest legacies of anthropogenic impacts, yet Fatmucket represented 72% of all mussels, and 4 species accounted for 96% of individuals. A consistency of species number and composition, with 4 to 6 species per site (except the one most upstream), suggested low habitat variation along the length of the stream. No obvious physical difference occurred even for the single site where Spike was abundant. That surveys across 2 years produced only 1 individual each of Flutedshell and Mucket and only old shells of Pocketbook and Threeridge, suggest a richer past assemblage even in Eagle Creek. Perhaps just Fatmucket and Giant Floater remain widespread as a consequence of impoundments, extensive agricultural land use, associated increases in specific conductivity, and decreases in discharge. Tolerance of chemical stressors is required and reported by Cooper et al. (2010, 2013) for Giant Floater and by Bringolf et al. (2007) for Fatmucket. Northeastern Naturalist 10 M.T. Begley and R.A. Krebs 2017 Vol. 24, No. 1 As landscapes continue to change from human development, connecting elements of change to abundance and diversity of mussel assemblages is necessary. Broader-scale watershed characteristics such as stream size (including drainage area, discharge, width, and depth) and catchment land use remain important considerations, but knowledge of local site conditions provide the useful addition of habitat variation. However, the effort required gathering site-specific physical, chemical, and biotic data rivals that of conducting mussel surveys. Given the extensive assessments conducted by diverse government agencies, our results suggest a benefit to surveying established biological and hydrological monitoring sites. Acknowledgments We would like to thank Jennifer Clark, Liz Barkett, Paul Orefice, Erin DePaulo, and Adam Morris for assistance in field work. Financial support was provided by the Cleveland State University Engaged Learning Award Program Literature Cited Allan, J.D., D.L. Erickson, and J. Fay. 1997. The influence of catchment land use on stream integrity across multiple spatial scales. Freshwater Biology 37 :149–161. Allen, D.C., and C.C. Vaughn. 2010. Complex hydraulic and substrate variables limit freshwater mussel species richness and abundance. Journal of the North American Benthological Society 29:383–394. Amin, I.E., and A.M. Jacobs. 2013. A study of the contaminated banks of the Mahoning River, Northeastern Ohio, USA: Characterization of the contaminated bank sediments and river water–groundwater interactions. Environmental Earth Scien ces 70:3237–3244. Atkinson, C.L., D.A. Christian, D.E. Spooner, and C.C. Vaughn. 2014. Long-lived organisms provide an integrative footprint of agricultural land use. Ecological Applications 24:375–384. Begley, M.T. 2015. Assessment of the freshwater mussel community of the Upper Mahoning River watershed and factors influencing diversity and abundance in small streams. M.Sc. Thesis. Cleveland State University, Cleveland, OH. 78 pp. Bringolf, R.B., W.G. Cope, C.M. Barnhart, S. Mosher, P.R. Lazaro, and D. Shea. 2007. Acute and chronic toxicity of pesticide formulations (atrazine, chlorpyrifos, and permethrin) to glochidia and juveniles of Lampsilis siliquoidea. Environmental Toxicology and Chemistry 26:2101–2107. Brown, K.M., G. George, and W. Daniel. 2010. Urbanization and a threatened freshwater mussel: Evidence from landscape-scale studies. Hydrobiologia 65 5:189–196. Cao, Y., J. Huang, K.S. Cummings, and A. Holtrop. 2013. Modeling changes in freshwater mussel diversity in an agriculturally dominated landscape. Freshwater Science 32:1205–1218. Clark, H.F., and G. Benoit. 2009. Legacy sources of mercury in an urbanised watershed. Environmental Chemistry 6:235–244. Cooper, S., L. Hare, and P.G.C. Campbell. 2010. Subcellular partitioning of cadmium in the freshwater bivalve Pyganodon grandis after separate short-term exposures to waterborne or diet-borne metal. Aquatic Toxicology 100:303–312. Northeastern Naturalist Vol. 24, No. 1 M.T. Begley and R.A. Krebs 2017 11 Cooper, S., E. Bonneris, A. Michaud, B. Pinel-Alloul, and P.G.C. Campbell. 2013. Influence of a step-change in metal exposure (Cd, Cu, Zn) on metal accumulation and subcellular partitioning in a freshwater bivalve, Pyganodon grandis: A long-term transplantation experiment between lakes with contrasting ambient metal levels. Aquatic Toxicology 132:73–83. Daraio, J.A., L.J. Weber, and T.J. Newton. 2010. Hydrodynamic modeling of juvenile mussel dispersal in a large river: The potential effects of bed shear-stress and other parameters. Journal of the North American Benthological Society 29:838–851. Dexter, R.W., L.H. Swart, and A.F. Davis. 1963. Comparison of the mollusks in adjacent Ohio River and Lake Erie drainage systems. Sterkiana 9:25–26. Duan, S., S.S. Kaushal, P.M. Groffman, L.E. Band, and K.T. Belt. 2012. Phosphorus export across an urban to rural gradient in the Chesapeake Bay watershed. Journal of Geophysical Research: Biogeosciences 117(G1). DOI:10.1029/2011JG001782 Falfushynska, H., L. Gnatyshyna, I. Yurchak, I. Sokolova, and O. Stoliar. 2015. The effects of zinc nanooxide on cellular stress responses of the freshwater mussels Unio tumidus are modulated by elevated temperature and organic pollutants. Aquatic Toxicology 162:82–93. Gagnon, P., W. Michener, M. Freeman, and J. Brim Box. 2006. Unionid habitat and assemblage composition in coastal plain tributaries of Flint River (Georgia). Southeastern Naturalist 5:31–52. Gangloff, M.M., and J.W. Feminella. 2007. Stream channel geomorphology influences mussel abundance in southern Appalachian streams, USA. Freshwater Biology 52:64–74. Gangloff, M.M., L. Siefferman, W. Seesock, and E.C. Webber. 2009. Influences of urban tributaries on freshwater mussel populations in a biologically diverse piedmont (USA) stream. Hydrobiologia 636:191–201. Gillies, R.R., J. Brim Box, J. Symanzik, and E.J. Rodemaker. 2003. Effects of urbanization on the aquatic fauna of the Line Creek watershed, Atlanta: A satellite perspective. Remote Sensing of Environment 86:411–422. Gordon, L.J., G.D. Peterson, and E.M. Bennett. 2008. Agricultural modification of hydrological flows create ecological surprises. Trends in Ecology and Evolution 23:211–219. Gordon, N.D., T.A. McMahon, B.L. Finlayson, C.J. Gippel, and R.J. Nathan. 2004. Stream Hydrology: An Introduction for Ecologists, 2nd Edition. John Wiley and Sons, Chichester, UK. Haag, W.R. 2012. North American Freshwater Mussels: Natural History, Ecology, and Conservation. Cambridge University Press, New York, NY. Haag, W.R., and M.L. Warren. 1998. Role of ecological factors and reproductive strategies in structuring freshwater mussel communities. Canadian Journal of Fisheries and Aquatic Sciences 55:297–306. Haag, W.R., and J.D. Williams. 2014. Biodiversity on the brink: An assessment of conservation strategies for North American freshwater mussels. Hydrobiologia 735:45–60. Hardison, B.S., and J.B. Layzer. 2001. Relations between complex hydraulics and the localized distribution of mussels in three regulated rivers. Regulated Rivers: Research and Management 17:77–84. Hatt, B.E., T.D. Fletcher, C.J. Walsh, and S.L. Taylor. 2004. The influence of urban density and drainage infrastructure on the concentrations and loads of pollutants in small streams. Environmental Management 34:112–124. Helms, B.S., J.W. Feminella, and S. Pan. 2005. Detection of biotic responses to urbanization using fish assemblages from small streams of western Georgia, USA. Urban Ecosystems 8:39–57. Northeastern Naturalist 12 M.T. Begley and R.A. Krebs 2017 Vol. 24, No. 1 Hoggarth, M.A. 1990. The Unionidae of the Chagrin River: The remnant of a molluscan fauna. Ohio Journal of Science 90:168–170. Howard, J.K., and K.M. Cuffey. 2003. Freshwater mussels in a California north coast range river: Occurrence, distribution, and controls. Journal of the North American Benthological Society 22:63–77. Jellyman, P.G., D.J. Booker, and A.R. McIntosh. 2013. Quantifying the direct and indirect effects of flow-related disturbance on stream fish assemblages. Freshwater Biology 58:2614–2631. Jones, K.B., A.C. Neale, M.S. Nash, R.D. Van Remortel, J.D. Wickham, K.H. Ritters, and R.V. O’Neill. 2001. Predicting nutrient and sediment loadings to streams from landscape metrics: A multiple watershed study from the United States Mid-Atlantic region. Landscape Ecology 16:301–312. Karr, J.R. 1991. Biological integrity: A long-neglected aspect of water resource management. Ecological Applications 1:66–84. Kaushal, S.S., G.E. Likens, N.A. Jaworski, M.L. Pace, A.M. Sides, D. Seekell, K.T. Belt, D.H. Secor, and R.L. Wingate. 2010. Rising stream and river temperatures in the United States. Frontiers in Ecology and the Environment 8:461–466. Krebs, R.A., W.C. Borden, E.R. Steiner, M.S. Lyons, W. Zawiski, and B.M. Walton. 2010a. Determinants of mussel diversity in Lake Erie tributaries. Journal of the North American Benthological Society 29:506–520. Krebs, R.A., J.D. Hook, M.A. Hoggarth, and B.M. Walton. 2010b. Evaluating the mussel fauna of the Chagrin River, A state listed “scenic” tributary in Ohio. Northeastern Naturalist 17:565–574. Layzer, J.B., and L.M. Madison. 1995. Microhabitat use by freshwater mussels and recommendations for determining their instream flow needs. Regulated Rivers: Research and Management 10:329–345. Lenat, D.R., and J.K. Crawford. 1994. Effects of land use on water quality and aquatic biota of three North Carolina Piedmont streams. Hydrobiologia 294:185 –199. Liess, A., A. Le Gros, A. Wagenhoff, C.R. Townsend, and C.D. Matthaei. 2012. Land-use intensity in stream catchments affects the benthic food web: Consequences for nutrient supply, periphyton, C: nutrient ratios, and invertebrate richness and abundance. Freshwater Science 31:813–824. Lyons, M.S., R.A. Krebs, J.P. Holt, L.J. Rundo, and W. Zawiski. 2007. Assessing causes of change in the freshwater mussels (Bivalvia: Unionidae) in the Black River, Ohio. American Midland Naturalist 158:1–15. Maloney, K.O., and D.E. Weller. 2011. Anthropogenic disturbance and streams: Land use and land-use change affect stream ecosystems via multiple pathways. Freshwater Biology 56:611–626. McRae, S.E., J.D. Allan, and J.B. Burch. 2004. Reach- and catchment-scale determinants of the distribution of freshwater mussels (Bivalvia: Unionidae) in southeastern Michigan, USA. Freshwater Biology 49:127–142. O’Hara, R.B., and D.J. Kotze. 2010. Do not log-transform count data. Methods in Ecology and Evolution 1:118–122. Ohio Environmental Protection Agency (OEPA). 2006. Methods for assessing habitat in flowing waters: Using the qualitative habitat evaluation index (QHEI). Available online at http://www.epa.state.oh.us/portals/35/documents/QHEIManualJune2006.pdf. Accessed 15 February 2017. Northeastern Naturalist Vol. 24, No. 1 M.T. Begley and R.A. Krebs 2017 13 OEPA. 2010. Evaluating beneficial use: Aquatic life. Available online at http://www. epa.state.oh.us/portals/35/tmdl/2010IntReport/Section%20G.pdf. Accessed 15 February 2017. OEPA. 2011. Total maximum daily loads for the upper Mahoning River watershed. Available online at http://www.epa.ohio.gov/portals/35/tmdl/Mahoning_upper_Report_Final. pdf. Accessed 15 February 2017. Oksanen, J., F. Guillaume Blanchet, R. Kindt, P. Legendre, P.R. Minchin, R.B. O'Hara, G.L. Simpson, P. Solymos, M.H.H. Stevens, and H. Wagner. 2015. vegan: Community Ecology Package. R package version 2.3-0. Available online at https://cran.r-project.org/ web/packages/vegan/vegan.pdf. Accessed 15 February 2017. Ortmann, A.E. 1909. The destruction of the freshwater fauna in western Pennsylvania. Proceedings of the American Philosophical Society 48:90–110. Pan, Y., A. Herlihy, P. Kaufmann, J. Wigington, J. van Sickle, and T. Moser. 2004. Linkages among land-use, water quality, physical habitat conditions, and lotic diatom assemblages: A multi-spatial scale assessment. Hydrobiologia 515:59–73. Peacock, E., W.R. Haag, and M.L. Warren. 2005. Prehistoric decline in freshwater mussels coincident with the advent of maize agriculture. Conservation B iology 19:547–551. Poole, K.E., and J.A. Downing. 2004. Relationship of declining mussel biodiversity to stream-reach and watershed characteristics in an agricultural landscape. Journal of the North American Benthological Society 23:114–125. Ramsey, F.L., and D.W. Schafer. 2002. The Statistical Sleuth. Duxbury, Pacific Grove, CA. Rashleigh, B. 2008. Nestedness in riverine mussel communities: Patterns across sites and fish hosts. Ecography 31:612–619. Roy, A.H., A.D. Rosemond, M.J. Paul, D.S. Leigh, and J.B. Wallace. 2003. Stream macroinvertebrate response to catchment urbanization (Georgia, USA). Freshwater Biology 48:329–346. Rzymski, P., P. Niedzielski, P. Klimaszyk, and B. Poniedziałek. 2014. Bioaccumulation of selected metals in bivalves (Unionidae) and Phragmites australis inhabiting a municipal water reservoir. Environmental Monitoring and Assessment 186:3199–3212. Stamey, J.D., and D. Beavers. 2009. Poisson and negative binomial regression. Pp. 885– 889, In M.W. Kattan (Ed.). Encyclopedia of Medical Decision Making, Vol. 2. Sage Publications, Thousand Oaks, CA. Strayer, D.L. 2008. Freshwater Mussel Ecology: A Multifactor Approach to Distribution and Abundance. University of California Press, Berkeley, CA. Strayer, D.L., and J. Ralley. 1993. Microhabitat use by an assemblage of stream-dwelling unionaceans (Bivalvia), including two rare species of Alasmidonta. Journal of the North American Benthological Society 12:247–258. Strayer, D.L., R.E. Beighley, L.C. Thompson, S. Brooks, C. Nilsson, G. Pinay, and R.J. Naiman. 2003. Effects of land cover on stream ecosystems: Roles of empirical models and scaling issues. Ecosystems 6:407–423. Strayer, D.L., J.A. Downing, W.R. Haag, T.L. King, J.B. Layzer, T.J. Newton, and J.S. Nichols. 2004. Changing perspectives on pearly mussels, North America’s most imperiled animals. BioScience 54:429–439. Swart, L.H. 1940. An ecological survey of the mollusks of the West Branch of the Mahoning River. M.Sc. Thesis. Kent State Universitgy, Kent, OH. 60 pp. Vander Laan, J.J., C.P. Hawkins, J.R. Olson, and R.A. Hill. 2013. Linking land use, instream stressors, and biological condition to infer causes of regional ecological impairment in streams. Freshwater Science 32:801–820. Northeastern Naturalist 14 M.T. Begley and R.A. Krebs 2017 Vol. 24, No. 1 Vaughn, C.C., and C.M. Taylor. 1999. Macroecology of a host–parasite relationship. Ecography 23:11–20. Vondracek, B., K.L. Blann, C.B. Cox, J.F. Nerbonne, K.G. Mumford, B.A. Nerbonne, L.A. Sovell, and K.H. Zimmerman. 2005. Land use, spatial scale, and stream systems: Lessons from an agricultural region. Environmental Management 36:7 75–791. Wang, L., J. Lyons, and P. Kanehl. 2003. Impacts of urban land cover on trout streams in Wisconsin and Minnesota. Transactions of the American Fisheries Society 132:825–839. Watters, G.T. 1992. Unionids, fishes, and the species-area curve. Journal of Biogeography 19:481–490. Watters, G.T. 1996. Small dams as barriers to freshwater mussels (Bivalvia, Unionoida) and their hosts. Biological Conservation 75:79–85. Watters, G.T., M.A. Hoggarth, and D.H. Stansbury. 2009. The Freshwater Mussels of Ohio. The Ohio State University Press, Columbus, OH. Weil, R., and A. Kremen. 2007. Thinking across and beyond disciplines to make cover crops pay. Journal of the Science of Food and Agriculture 87:551–557. Wittine, A.H. 1969. Distribution of unionids in Hinkley Creek, Portage County, Ohio. Compass of Sigma Gamma Epsilon 46:142–149. Wolman, M.G. 1954. A method of sampling coarse river-bed material. Transactions, American Geophysical Union 35:951–956. Yoder, C.O., and E.T Rankin. 1995. The role of biological criteria in water quality monitoring, assessment, and regulation. Ohio EPA Columbus, OH. Technical Report MAS/1995-1-3. Available online at http://www.epa.ohio.gov/portals/35/documents/ instbusl.pdf. Accessed 15 February 2017. Yoder, C.O. and E.T. Rankin. 1996. Assessing the condition and status of aquatic life designated uses in urban and suburban watersheds. Pp. 201–227, In L.A. Roesner (Ed.). Effects of Watershed Development and Management on Aquatic Ecosystems, American Society of Civil Engineers, New York, NY.